S14 - Episode thirteen "Lebanon” The 300th episode! Here is a fan art poster for you to enjoy made by: Chris @stonewoodzri Chris's tumblr. Guys, we are getting the Lebanon episode for 300. Outside perspective on what the hell the townsfolk think about the boys. Not quite as meta as 200, but more than 100. That is, if it doesn't all fall apart as the season progresses! Dabb seems uncertain, but that's the plan. Supernatural Boss Teases Episode 300: It Will Be 'Heartwarming, With Murder' from TVLine! This episode will focus on how the town of Lebannon sees the boys and Cas. I wonder how they will make this episode. It can be very hilarious. So proud of @jarpad and all the #Supernatural cast and crew for the 300th episode ? Yesterday I visited the set of #Supernatural de @warnerchannella and was fascinated with the care and love with which they make this series that already has 14 seasons, which is not afraid to kill their protagonists (and revive them) & whose audience grows every season. I'm interviewing the supernatural actors from @WarnerChannelLA and I got Mark Pellegrino. I'm holding on for explaining to him by the end of Lost. Tiny spoilers for episode 13 from TVLine! Episode 13 spoilers from CinemaBlend! Yes, the 300th episode is here! To think we were all enamored when they hit 100 episodes... Then there was 200... Now 300! And “awesome” is something that can be said of the concept for episode 300. Written by Showrunner Andrew Dabb and Meredith Glynn, the episode will give us the perspective of the townsfolk of Lebanon, Kansas (the place the boys have called home in the bunker since season eight) on these weirdos in their midst. @yvrshoots #Supernatural is setting up for night shoot on my street in #newwestminster . Check out my photos and you will see the cross streets. Today it was cold so it was a hoodie type of day.? HUGE, huge, HUGE cast spoiler! The spoiler of all spoilers! #tbt to when shooting the 300th episode last week this guy tried to steal my job! #Supernatural is back filming season 14 in Vancouver next week. What do we know about #SPN300 which wrapped just before the hiatus? Supernatural filmed for several nights on south Burnaby’s Backlot town set (built for Watchmen) as Lebanon, Kansas. I saw Supernatural filming there in Season 6. Supernatural shot there until 3 a.m. one night. JDM, are you there?#Supernatural300 still filming on the "Watchmen set" in south Burnaby tonight. The CW made Supernatural’s 300th episode a cornerstone of its May Upfront to advertisers in New York City. Jared Padalecki, Jensen Ackles and Misha Collins took to the stage to talk about it. Glad there’s no rain tonight. Last night was windy and rainy. Dang those cutters that let loose yesterday. ?Thankful ‘everyone’ was on the ball and all okay. Merry Christmas. Happy Hiatus! Morgan, who boarded the series in its first season in 2005 and appeared across 12 episodes, reprises his role as John Winchester, a once-disappeared hunter of all things supernatural and father of Dean (Jensen Ackles) and Sam Winchester (Jared Padalecki). The star’s long-awaited return to Supernatural marks his first appearance on the series since 2007, where Winchester’s spirit escaped from Hell to help his sons defeat the demon Azazel before moving on. “So 14 years ago I played the father of Sam and Dean on that show, the two boys... so yeah, to go back and be able to do that with them was a blast, super cool,” Morgan said. “We’re incredibly excited to have Jeffrey back for this milestone episode, and think fans will love what we have planned for his character... and a few other guest stars,” executive producer Andrew Dabb said when announcing Morgan’s return in December. John will not be the only face from the past we see. 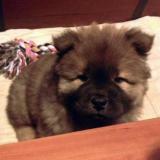 There is a guest star that will play a significant role. This episode will focus on how the town of Lebanon sees the boys and Cas. Jacksonville Con occurred during filming. Supernatural brings Kurt Fuller's Zachariah back for 300th episode from EW! Jeffrey Dean Morgan on returning to his Supernatural family after more than a decade away from EW! Jeffrey Dean Morgan defends Supernatural dad: He 'shows love in different ways' from EW! Misha Collins explains what Castiel's up to in Supernatural episode 300 from EW! John is there as a sort of wish granted for Dean. Kurt Fuller previews Zachariah's return in Supernatural episode 300 from EW! Supernatural bosses on why now's the right time for John's return from EW! Supernatural stars Jared Padalecki, Jensen Ackles on why episode 300 isn't the show's end from EW! Padalecki sympathized with the conundrum of writing an episode worthy of this anniversary, saying, "I feel for the writers because they have to decide if they're going to go crazy meta, just a true shout out to the fans like Episode 200, or if they're going to make it an episode that still progresses the storyline or some mixture of the two. It's a daunting task, no doubt." We now know that Sam and Dean's father, John Winchester (Jeffrey Dean Morgan) will make an appearance in Episode 300, thanks to a wish-granting scenario that will occur for Dean. The elder Winchester won't be the only one to get closure from John's visit though. Padalecki told TV Guide that this episode will be very cathartic for Sam, who always had a turbulent relationship with his father. "There's some scenes that also make it come full circle," Padalecki said. "For Sam specifically... we see [him] get some reconciliation that he hasn't really had, he's been desiring. He didn't even know he was really looking for this. We see him tie up some loose ends and really make the most of his situation, and it's a pretty awesome situation." Supernatural star Samantha Smith previews Mary's 'romantic' reunion with John from EW! See all the promo photos from Supernatural's 300th episode from EW! Supernatural will air its 300th episode, titled “Lebanon,” on Thursday, Feb. 7. We’ve rounded up all the photos from the hour, in which will see the return of Jeffrey Dean Morgan as John Winchester. After 300 episodes, Supernatural's Chevy Impala is still rumbling down the road. When Supernatural first premiered on The WB back in 2005--the same year YouTube came into existence--it was introduced as the story of two brothers, reunited and fighting the evil forces their family had been chasing for years. Now, 300 episodes later, Supernatural is still exactly that. While secondary characters have come and gone, it always comes back to the tale of Sam Winchester (Jared Padalecki) and his brother Dean (Jensen Ackles), traveling from town-to-town and vanquishing whatever otherworldly forces seem to be wreaking havoc. There's a third piece of the Winchester puzzle that's been with the brothers since the very beginning, though, and it's as integral to the formula as anyone or anything else on the show. When Dean rolled back into his brother's life in the show's pilot, he did it in his trusty 1967 Chevrolet Impala, nicknamed "Baby" and passed down to him by his dad. Baby, in many ways, is the heart and soul of Supernatural. For the brothers, it is the armory of weapons they use to fight against any number of demonic entities, their home on long nights with no motel room in sight, and the vessel that takes them to a new locale each week. The car has even had its own episode of the series in Season 11's "Baby," which told a story from the Impala's point of view. What's more, Baby is the one piece of the Winchesters' past that they've been able to hold onto. The one thing that's always there for them, regardless of circumstances, ever since it was passed to Dean from their father. "I think if Dean were a child Baby would be his blanket," Ackles explained to GameSpot at Supernatural's 300th episode celebration. "That's his safe place. [It's] kind of the touchstone of who he is. It represents a lot, and I think it represents a lot to the show. It's the one constant in his life other than his brother." 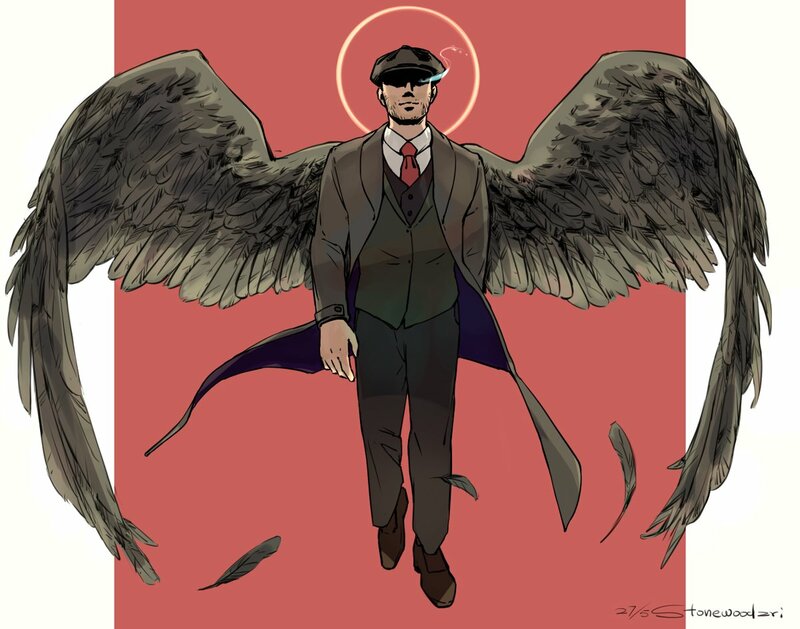 A constant isn't exactly something Dean--of his brother, for that matter--has the luxury of, given the life of a hunter of supernatural entities. While it may be the "Family business," as Dean has reminded viewers of several times over the years, it's a truly lonely existence, even with your brother at your side. After all, the character is nearly 40 years old, and his entire life is wrapped up in his work, his brother, and his car. He's not the kind of person that you truly believe will ever be willing to settle down and live peacefully because he thrives on the chase and having no specific place he considers home other than the driver's seat of his Impala. It's something that's simply his. "For somebody who lives kind of a vagabond life and a nomad existence, to have a constant like that, to have something that is his and that is his domain is, I think is really important to the character," Ackles continued. "You'll see a scene in an episode that we're filming, we just finished filming, where Dean says, 'I need to go clear my head. I need to go for a ride in Baby,'' and Sam says, 'Well, let me go with you.'' He says, 'No, no, no, I just need me and Baby and a long stretch of highway.'" While to outsiders who haven't taken the ride with Supernatural over the last 300 episodes, it may seem like Baby is just a car, fans know better. With total respect to Misha Collins, who plays the angel Castiel and has become one of the show's most beloved characters, Baby is the third lead of the series. What would have been three tons of steel on most shows is a fully fleshed out character on Supernatural. And according to executive producer Robert Singer, who also directed the 300th episode of the series, she's one of the reasons why, all of these years later, Supernatural is still speeding down the highway and has already been renewed for an impressive 15th season. "It's as much of a character as anyone else in the show," he said. "And yeah, [we] keep waiting for it to break down, but it's still humming." verything changed when stuff got biblical. When they’re not possessed, the Winchesters usually are on the side of the angels. (well, some of the angels). Because saving the world doesn’t pay so well and they need of gas, food and hotel money, the guys have done some shady stuff. They’ve been wanted outlaws and made a regular habit of impersonating FBI agents, park rangers and other law enforcers. 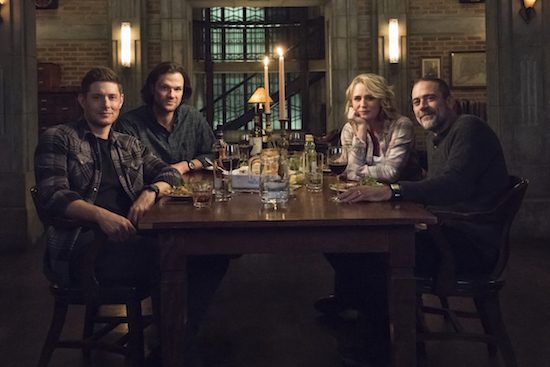 ‘Supernatural’ Team Talks ‘Homage to the Winchester Family’ 300th Episode from Variety! How ‘Supernatural’ Has Gone Beyond the Screen to Impact Business, Culture, Charity from Variety! TVLine isn’t done celebrating Supernatural‘s tear-filled 300th episode. In our exclusive video from the installment’s official behind-the-scenes featurette, Jeffrey Dean Morgan admits that he’s recognized as a couple of famous characters. But for viewers of the long-running CW series, there’s only one that matters. Morgan’s long-awaited return as the deceased patriarch in last night’s milestone hour “was always something that was in the cards, but it was almost kind of like an ace in the hole,” star Jensen Ackles describes in the video, which also offers glimpses of Morgan’s on-set reunion with the crew and a candid moment with Ackles. The full featurette about the 300th episode will be available on digital platforms with the purchase of a Season Pass on Tuesday, Feb. 12. Supernatural boss explains ending to show's heartbreaking 300th episode from Digitalspy! After much teasing, Jeffrey Dean Morgan finally made his return to Supernatural last night (February 7) for its special 300th episode. His character John Winchester was reunited with his sons Sam and Dean thanks to magic shenanigans, and there were plenty of tears and healing old wounds. Unfortunately, it didn't last long. Plucking their dad out of the past meant that time threatened to change for the worse, and the brothers had to make the tough decision to say goodbye again before the changes become permanent. While the boys will remember what happened, it's unclear if John will, something that TVLine put to the show's boss Andrew Dabb. He said: "I think it would create some problems for us, time travel-wise, if he remembered everything. He thinks it is a dream. And it didn’t change him, it didn’t change our history, but I would like to think it did, for maybe just a small amount of time, soften him toward Sam [and] Dean. "The John we see in season 1 is very much not the John we’ve talked about who existed before Sam went away. That John was much more hard-edged… And I would like to think that, possibly, this dream, this experience that happened, marks that turning point." There is an article on #Supernatural and the 300th episode in USA Today! Continually Updating our #SPN300 Takeover Coverage! "You kept her!" Happy Episode 300! + Jared & guest actress on set ? So grateful to be a part of the 300th episode of @cw_spn ?? Caught in the act on set of @cw_spn ? “All right, we can think about what’s coming. SUPERNATURAL Creator Eric Kripke on His ‘Unexpectedly Emotional’ Reaction Episode 300 from Give Me My Remote! When SUPERNATURAL aired its 300th episode in February, a very special viewer watched the Winchester family have a bittersweet reunion: series creator Eric Kripke. The writer has always been a vocal supporter of the series, but the milestone prompted tweets about the hour itself and a look back at where everything started. Some previously unreleased photos from #Supernatural "Lebanon"